Guernsey is something of a cyclist’s paradise. The island’s famous natural beauty, modest size, varied terrain and wealth of historic landmarks are elements that combine to make this almost the perfect cycling destination. Whether you are specifically looking for bike-based Guernsey holidays or are just thinking of adding a trip or two into a more diverse itinerary, this article will introduce you to four of our favourite rides out of the 11 official routes that visitors can take to explore the island. If any of the below options appeal to you, be sure to make a note of their numbers (which you will find in parentheses) before travelling to Guernsey, as each route is discreetly but clearly signposted at key points. This route – unsurprisingly – is designed to take you all around Guernsey’s northernmost area, the parish of Vale. Although the full route is on the lengthy side (roughly 10 miles in total), it is straightforward in terms of the difficulty and type of terrain involved – the ride is generally very flat and much of it is on well-surfaced yet quiet main roads. Guernsey is full of fascinating history, but Vale is particularly rich in this regard, featuring a range of well-preserved landmarks from different eras. And the best thing of all is that many of the area’s historical highlights can be seen up-close without even having to get off your bike! Just a couple of the unique sights you will be presented with are the striking ‘loophole’ towers that were built as defences against French invasion in the late 18th-century and two extraordinary passage tombs from the Neolithic period. Even if history isn’t your thing, the ‘Top of the Island’ route will still be well worth exploring if one of the reasons you’re coming to Guernsey is to soak up its stunning landscape. Along with the idyllic, winding country lanes that make up the ride’s inland sections, the views that await you when you reach the coast include the neighbouring islands of Herm, Jethou, Brecqhou and Sark, as well as the lighthouses at Alderney and Les Casquets. Most of this route is in the south-eastern parish of St Martin. The island’s longest official ride (at 12 miles), ‘Peninsula & Pasture’ is also one of its more difficult, consisting of varied, rolling terrain and a series of challenging climbs. One for the more experienced cyclist, this route will prove to be incredibly rewarding for those who are able to complete it. There are plenty of interesting sights to look out for as you make your way around the route, ranging from majestic country houses to intriguing ancient statues. A few ‘must-sees’ are the Doyle Monument (erected in 1953 as a replacement for the original structure, which was destroyed during the island’s occupation in World War II), a Neolithic carved standing stone known as ‘La Gran’ Mere de Chimquiere’ that is said to bring good luck to anyone who touches it, and the centuries-old Sausmarez Manor. As its name would suggest, ‘Peninsula & Pasture’ will also allow you to explore contrasting natural scenery, taking in everything from tranquil woodland and rugged cliffs to rural pastureland and picture-postcard cottages. Those hoping to capture the perfect coastal photo should plan to stop off at Icart and Jerbourg Points – both provide dramatic sea views that you will surely never forget. 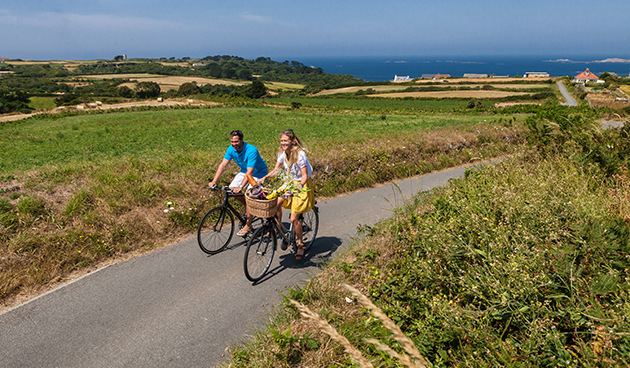 The last of Guernsey’s official cycle routes is one which would be a great choice for anyone keen on discovering as much of the island as possible in a single trip. Although it is less than 10 miles long, this ride stretches all the way from the north coast to the south and – as you may have already guessed – takes in no less than five of Guernsey’s 10 administrative parishes. As with all the island’s signposted routes, ‘Five Parishes’ can be picked up at almost any point, depending on how challenging you would like your journey to be. If you do decide to take on the whole thing in one go, however, you will find that the riding conditions change from easy to difficult several times, with flat sections and gentle gradients being closely followed by stiff, strenuous climbs. There are plenty of historic and modern points of interest that are worth paying a visit to along the way, as well, including L’Ancresse Common in the parish of Vale, which features everything from ancient burial sites to an outdoor shooting range! Given its nature, it will come as no surprise to learn that virtually every aspect of Guernsey’s breath-taking natural scenery is covered in the ‘Five Parishes’ route. Embarking on this testing ride will give you a taste of just how diverse the island’s landscape is; some of the highlights you can look forward to enjoying are the beautiful bays at L’Ancresse and Pembroke, the bustling harbour at St Peter Port, and the quiet country lanes of inland Vale parish. Choosing to travel this route will be perfect for any visitors who most enjoy immersing themselves in the stunning countryside. A challenging but doable 11 miles, this ride is made up of rolling terrain and the occasional steep hill climb. As well as the lovely rural areas that are found across the Talbot Valley Circular and the amazing coastal vistas provided by spots like the peninsula near Vazon Bay, this route is also one of Guernsey’s best in terms of the number of historic landmarks that it offers. Some sights of note include the iconic Little Chapel (one of the smallest and most intricately decorated places of worship in the world), the haunting German Underground Hospital (built by enslaved labourers during the Nazi occupation), and the impressive 19th-century Martello tower defences at Fort Hommet. Due to this ride’s lengthy nature, and the fact that it features so many interesting sites, we recommend that you set aside a whole day if you want to do the route from start to finish. We can guarantee, however, that you won’t regret taking this opportunity to see so many of Guernsey’s most famous and scenic places in one go. This entry was posted in Guernsey and tagged Cycling in Guernsey. Bookmark the permalink.